It’s a mini helmet. It’s a mini lighter. It’s a Helmet Lighter. 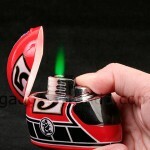 The ideal lighter for lighting up that post-race victory cigar.